Automatically compile survey results per contact and account, and keep current and historical results up to date in your CRM for accurate records. Do I need this flow? If you have survey data, or any bulky data stream, then this flow can help you process, clean, and sort that data into another system, such as a CRM or marketing automation tool. 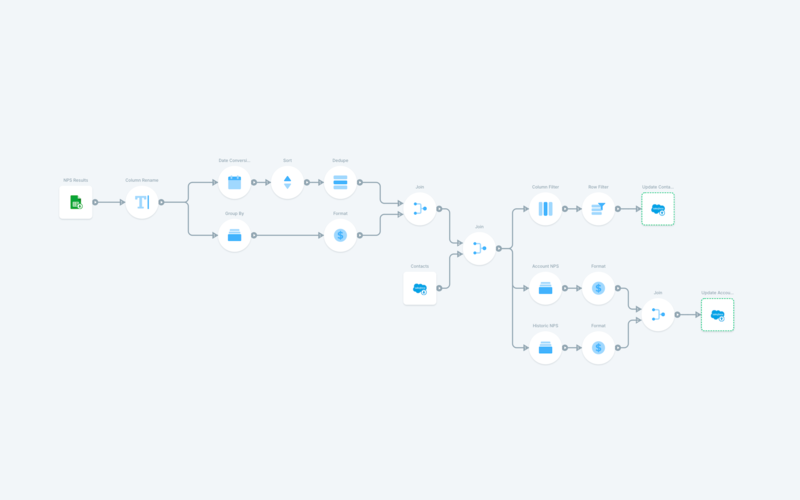 Sales teams, marketing teams, and any customer facing team can see a huge productivity boost with a flow like this running every hour or every day. Surveys are an easy way to get continuous feedback from customers about your product, service, or team. The problem with surveys is that their data is cumbersome, and if you allow recipients to take your survey many times, like an NPS survey, then you will have an unknown amount of entries per person. This flow turns that bulky survey data into usable values that are linked to users and companies. tracking the historical average of score data like this for an organization lets your team know where to focus efforts. Also knowing the most recent score shows the trajectory of the score, and the results of your work. This flow works on a schedule of your choosing to updated a CRM with calculated NPS data on a Contact (user) or Account (company) level. It pulls in NPS survey results from anywhere to start. Then, using a few Parabola objects, it sorts the data into a historical average NPS, as well as the last score. Both numbers are beneficial to create a complete picture of a customer’s journey. With a Salesforce Import, the flow brings in the contact id, account id, and email fields for all Contacts in our Salesforce account. The Salesforce id is joined to the NPS data table using a Join object and matching on email. Now we have two id’s for each entry in our table, which will allow us to easily upsert the data back into Salesforce. The flow branches off into a section to update Contacts, and other to update Accounts. The Contact branch removes rows with blank NPS data, and then uses a Salesforce Export to upsert the NPS data into a custom NPS field on the Contact within Salesforce. The Accounts branch creates averages for the current and historic NPS of all Contacts within the Account, and then upserts that data into custom fields on the Accounts within Salesforce.